St. George’s Church was designed by the architect Charles Augustus Busby for Thomas Read Kemp M.P. in 1824-5 to serve the new estate at Kemp Town, and was consecrated on 30 December 1825, opening to the public the following day. It is an elegant, classical, listed building, with a recessed Ionic portico and a Grecian bell-tower surmounted by a cupola and gilt metal cross. 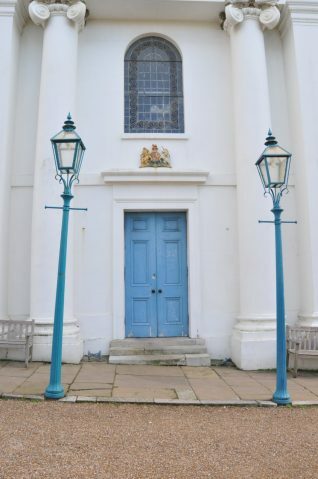 Two lamp posts stand in front of the west entrance to the church. They are early to mid 19th century in design and are a matching pair. 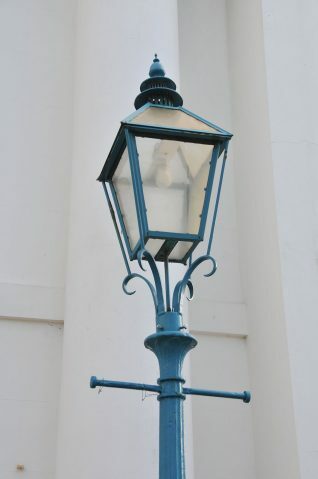 The lamp posts are made of cast-iron, fluted with a tapering shaft which rises from cushion base to basket capital. Just below the capital they have a yoke maintenance arm.